This book has some really cute illustrations. I enjoyed the friendship between the monkey and the elephant and all of the ways that the monkey tried to get a peanut from Kaboodle. He tried balancing things while riding a unicycle, streaming a banner from an airplane, painting a picture of Kaboodle, etc but nothing worked In the end Kaboodle tells him that he never said "please". Kit says please and gets a peanut but then throws paint at Kaboodle for not saying "you're welcome". After enjoying the story and the lesson in manners I was quite surprised at the ending. I don't think the idea of throwing paint at anyone or anything is a lesson we want our kids to learn. The author should have thought of a more appropriate way to teach the rest of the lesson, of saying "you're welcome". Unfortunately because of the ending I couldn't really recommend this book. Perhaps there is still time for a change in that part of the book?I received an ARC of this book from the publisher and NetGalley, thank you. 'Please', 'Thank you', and 'You are welcome' are magical phrases. 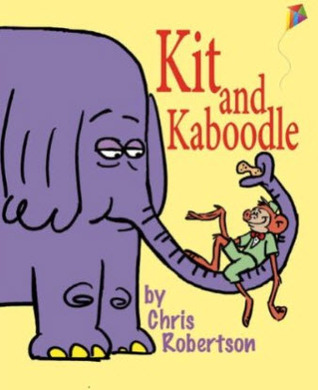 Kaboodle, the elephant, refuses to share peanuts until his friend Kit learns to use those magical words. This book was more engaging than most thrillers I read this year. I turned the pages feverishly to know how Kit would up his game to impress Kaboodle and win that teeny-weeny peanut. This is a beautiful book which will aid parents to make their children learn some good manners. Delightful read! Kaboodle, the elephant is chomping away at his bag of peanuts and Kit the monkey, his friend asks him for one. When Kaboodle says no, Kit tries all sorts of things to impress his friend and score a peanut. He does everything but say please. There are few words in this book and toddlers will be able to "read along" with the repetitive words. This is a great book on manners and the importance of being polite and using the words and phrases, Please, Thank-You and You're Welcome. Kids will love seeing the extent Kit goes to trying to impress Kaboodle enough to score that little peanut. The illustrations are hilarious, I love seeing the shark almost eat Kit. My grandson giggled at this one and loved seeing what Kit was going to do next. The only thing that bothered me about this book was the ending. I did not think throwing paint on Kaboodle because he forgot to say "You're Welcome" was a good choice. The publisher generously provide me with a copy of this book via Netgalley. This delightful book will have kids giggling as a serious, kind of grumpy, elephant (Kit) munches on his bag of peanuts and gets more and more annoyed at a spirited little monkey (Kaboodle) who wants to share his bounty.Kaboodle tries everything possible to change the elephant's mind, he: juggles china cups and plates to persuade him.... No! !, actually places his head inside a lion's mouth.... NO! !, flies a plane upside down showing off his aerial expertise... NO! !, and he even performs dangerous bungie jumping exercises. But alas the elephant's response is still an emphatic... NO!!! Finally Kaboodle learns the secret to having that yummy peanut released for him to enjoy. Can you guess what it might be? The book contains a valuable life lesson for little ones and if put into action many wonderful things will be granted to them and they will be held in high esteem by all. There is an added twist at the end of the book that will make kids laugh. I love the simple, uncluttered illustrations and the expressions portrayed by both characters. The colours are bright and cheery and imagination reigns. I love the book and highly recommend it. "Please" get a copy of the book to share and enjoy. "Thank you very much!" Elephant doesn't want to share his peanuts. Monkey is determined to throw every trick in the book at him to impress him into sharing. In the end, Monkey is reminded to say "please," and Elephant is reminded to say "you're welcome" in a very humorous way... One I hope my own children don't use. ;-) The illustrations are vibrant and entertaining. They are sure to make small children laugh. What I found really interesting about them was that while reading in Adobe Digital Editions the pages look like a still frame movie flipping. The continuity of design is amazing and something I've never seen done so well in a picture book.I received an ARC in exchange for my honest review. An elephant is chomping away at a bag of peanuts and a monkey asks him for one. The elephant says no, but that doesn’t stop the monkey. He tries everything he can think of to impress the elephant enough to give him a peanut…but it turns out he could’ve had one for something very simple.A bright and colorful book featuring two memorable critters, a little hyperbole, and the fact that being polite is more impressive than bungee jumping or sticking your head in a lion’s mouth. The text is simple and repeated, perfect for beginning readers to “read” along and start to learn some sight words. Definitely the most memorable book on manners I’ve come across in a while. Also, that monkey must REALLY like peanuts. Kids should get a giggle out of the lengths he’s willing to go for a little peanut. Recommended for beginning readers, kids learning to say please and thank you, and animal fans. I’ll keep an eye out for this one for our elementary library. I received an ARC of this title from the publisher through NetGalley in exchange for an honest review. *thank you to NetGalley and the publisher for a copy of this book in exchange for an honest review*5 stars.You know what. This was actually really funny! It was so basic. So little detail. BUT, the story was amusing. It kept my attention, the illustrations were well done and appealing and the end of the book makes us both laugh and sends us a very important message (I wont give it away but im positive its one you want all of your children, and those adults who are still children, whatever age, to know!). This book was short but fantastic! Any book that can make me and others laugh, is already a winner. 5 stars well deserved! What will it take for an Elephant to give a monkey a peanut? I do not know which one is Kit and which is Kaboodle, but I can tell you that they are cute. I am going to guess Kit is the Elephant. Kaboodle tries various exploits to get a peanut from kit. He flies a plane upside down, tries bungee jumping, and juggling while riding a unicycle. But only one thing will make Kit share his peanuts. Maybe you can guess. I don’t want to spoil the fun. This is a very simple book on the lines of Elephant and Piggie that will be loved and shared by all readers. I know it was supposed to be funny, but that ending knocked it from a four star to a two star...what in the world? Cute picture book for toddlers. Kaboodle the elephant won't let his best friend monkey Kit have a peanut, so Kit tries to plead with his friend in a variety of fun ways. Together they learn valuable lessons about sharing and manners. The drawings are lovely and my granddaughter loved it. My love of digital reading has extended to children's picture books too! While I LOVE my library, I can't tell you how many fines/lost books I've had to pay for. I've been able to collect a pretty good digital library for the little ones, and it's fun to read them on the Kindle, Computer or Ipad.Not all the free offerings are good (I've picked up duds from the library too though)but there are some gems out there. This is one. Bright, creative illustrations. Simple words, repeated, and a little lesson in manners presented in a fun way.I got this for free (there are a few different email lists/blogs that feature free reads), and it's available for Kindle Prime, but I think it would actually be worth a purchase (although it is a very quick read). My daughter gives this story 10 fingers out of 5. :D She loved that she could read it by herself and she also loved the monkey. At first I wondered where the story was going, but in the end there was a good lesson to be learned. Overall, it was a quick, fun read and it was great to have a children's story in e-book format. 10*s. This is a magnificent read about manners with comedy thrown in to keep the kids entertained!! I loved the illustrations and story line!!! This is a MUST read for the entire family to enjoy!! A fun, funny little story with bold colors, cute animals and a darling title. My 1 1/2 year old loved it and we read it 3 times back to back. I immediately searched our local library for other titles by Chris Robertson and we read through each over the following week. Great, easy read for young readers. Chris Robertson - Chris Robertson is an author/illustrator of Children's Picture Books. His most recent book is "Harry and the Hot Lava". Chris's other books include "My Yellow Umbrella", "I'll Trade My Peanut-Butter Sandwich", "Little Miss Liberty", "Kit and Kaboodle", "The Tooth That's on the Loose!" and "Pandora's Box" with Julia Dweck. Chris's whimsical cartoon style feels light-hearted and carefree which seems to perfectly match his humorous writing style.While in elementary school, Chris was introduced to "Curious George", "Madeline", and "Harry the Dirty Dog" by way of the Bookmobile. The introduction left such a strong impression, that even at an early age, Chris knew children's books were going to be an important part of his life.